This National Film Unit newsreel offers a wide-ranging look at ‘the national game’ in 1966. A muddy potted history (scored to rugby folk song ‘On the Ball’) rakes from the age grades to a Ranfurly Shield match, to the apex: the All Blacks. Ex-All Black fullback Bob Scott talks about the need for ‘four stone bantams’ to enjoy the game, while fellow AB Don ‘The Boot’ Clarke discusses the problems for a country player; Wellington College’s 1st XV plays a ‘traditional’ against Nelson in front of a mass haka on the terraces; and club players explain why they play (“it’s a manly game”). 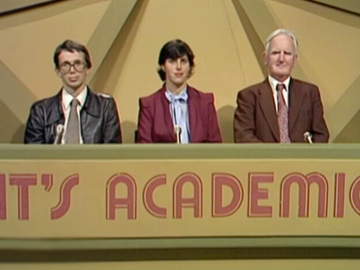 It's Academic was an 80s general knowledge quiz show for high school students. Like its intermediate school sibling The W Three Show (aka W3), It's Academic was hosted by Lockwood Smith. With his Cheshire cat's grin the future Speaker of the House pulls questions from the numbered pockets, as teams from Onslow, Wellington and Newlands colleges — seated in the distinctive triangular pod set — compete in the Wellington regional final. At stake are brainiac bragging rights, school pride ... and digital watches, Britannica encyclopedias and handheld calculators. In Wellington, Hāmi Grace was respected for his cricketing and rugby prowess. In Gallipoli, his sniper skills became legendary. 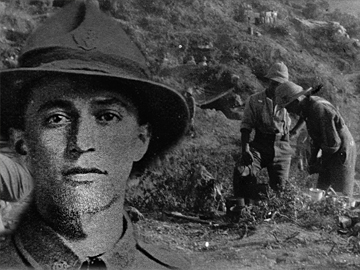 This four minute short documentary uses Grace's diary entries to recount his experiences at Gallipoli with the Wellington Battalion. The former Wellington College pupil turned lieutenant wrote about the squalid conditions, graves "everywhere", and fighting the Turks. Grace was killed at Chunuk Bair in August 1915. Every year Wellington College holds a remembrance ceremony for Grace and the 29 other former pupils who died in Gallipoli. This documentary explores resurgent interest in Anzac Day and examines the Kiwi desire to “remember them” (those who served in war) — ranging from patriotism to protest to burgeoning dawn services. The doco is framed around the return of the Unknown Warrior to a Wellington tomb in 2004; and a trip to Trieste, Italy, for Gordon and Luciana Johnston and their 24-year-old granddaughter Kushla. Gordon was a World War II gunner and Luciana an Italian nurse. Kushla learns of their war experience, and the early Cold War stand-off in Trieste following Nazi surrender. Our Stars of Ballet, a short documentary from ballet teacher turned NFU director Kathleen O'Brien, tracks the careers of New Zealand ballet icons Rowena Jackson and Alexander Grant, who both achieved success as principal dancers for major ballet companies in England. The film follows their visit to Wellington with the Royal Ballet in 1959; Jackson picnics by the harbour with dancer husband Philip Chatfield, while Grant visits Mt Victoria. The film ends with Jackson performing her famed multiple fouttés en tournant, for which she held the world record in 1959. In World War l Leslie Beauchamp was a soldier in the British Army, who died aged only 21 when a grenade exploded in his hand during a training demonstration. This episode of mini documentary series Great War Stories remembers Beauchamp through the words of his sister, writer Katherine Mansfield. 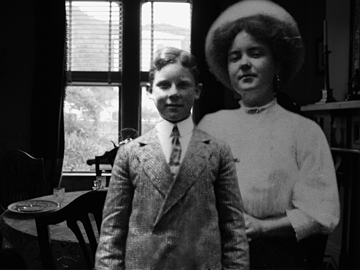 Leslie's time growing up in Wellington is examined, as well as the mutual affection between brother and sister — including samples from letters they wrote to one another, and tributes that Mansfield would pay to him in her fiction and poetry. This 1982 film, made for the New Zealand Council for Recreation and Sport, is an impressionistic exploration of play. Child narrators talk about what play means to them, while the images capture young people engaged in recreation. The focus is on informal play: kids and teenagers at playgrounds, hunting for frogs, reading, skylarking in the snow, doing cartwheels on the beach, fixing motorbikes, skipping, stargazing and playing Space Attack. Seagulls inspire dreams of flight for a young girl, and a fancy dress ball for adults shows the enduring spirit of play. 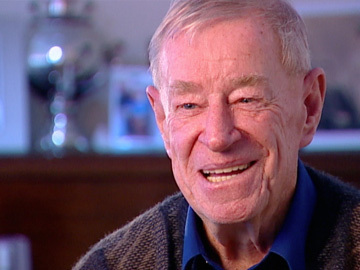 This 2006 documentary is a portrait of one of New Zealand politics' most contradictory figures: unionist Ken Douglas. At the time of filming Douglas occupied numerous board positions (eg Air New Zealand, the NZ Rugby Football Union), but early on he was a truckie and Marxist. Rob Muldoon branded him 'Red Ken'. For 15 years until 1999 he led the Council of Trade Unions. Directed by Monique Oomen for Top Shelf Productions, the film is framed around interviews with Douglas and his colleagues, and asks whether he is a turncoat or a strategic realist moving with the times.